Acanthocereus tetragonus, formerly known as Cereus tetragonus, is a tall, columnar cactus native to southern Florida and the Lower Rio Grande Valley of Texas in the United States, Mexico, Central America, Caribbean, and northern South America. Acanthocereus tetragonus ‘Fairy Castle’, commonly known as Fairy Castle Cactus, is a miniature cultivar of this species with many curved branches that resemble the turrets of a castle. As some expert classify this cactus as a cultivar of Cereus hildmannianus, it is also known as Cereus hildmannianus f. monstruosus ‘Fairy Castle’. This cactus is a very slow growing plant that reaches up to 6 feet (1.8 m) tall. The stems are 5-sided with woolly based spines along each plane. The limbs are a bright green turning woody and brown with age. Different branches are formed over time which slowly lengthen and produce an interesting silhouette. Nocturnal, white or yellow flowers are rarely produced. They are large and usually will not occur until the plant is 10 years old or more. Fairy Castle Cactus is easy to care for. 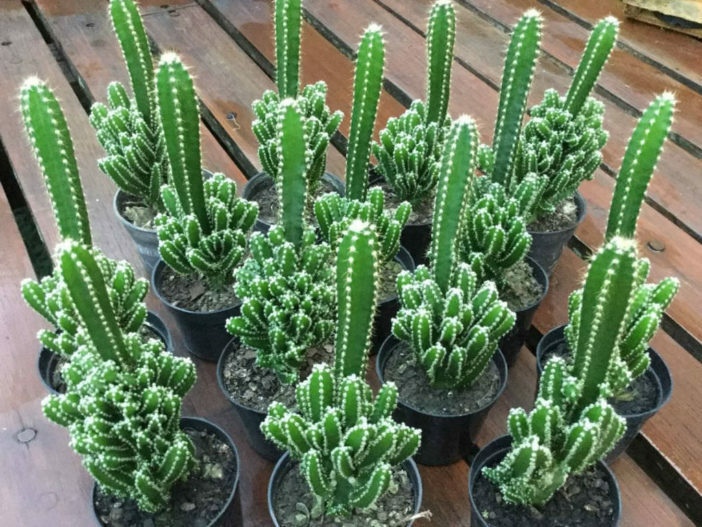 It is one of the most commonly sold indoor cacti because of its popularity among beginners. You can find them at any garden center, online, or even your local grocery store. They are often sold with bright straw pink or yellow flowers hot-glued to its spires. Many growers prefer to gently remove the fake flowers, or allow them to fall off as the cactus grows. Fairy Castle Cactus is a full sun plant that requires well drained soil. Plant the cactus in an unglazed clay pot that allows excess moisture to evaporate. Fairy Castle Cactus will grow best in a good cactus potting soil or you can make your own. Fairy Castle Cactus needs plenty of space for its roots. Repotting should be done every other year, or when the plant has outgrown its pot. Fairy Castle Cactus propagates quite easily from cuttings. Simply sever a branch and replant in moist, well-drained soil. It helps to allow the cut end dry out and harden before you replant it. This makes it easier for the new cactus to form roots.